Hi Magic SandBox friends! It’s me, Grayson! It’s really cold at my house today. I heard the weather person saying that it’s going to be really cold the next couple of days too. I thought this would be a good time to share some of my tips with you about keeping your pets happy and healthy in the cold weather. As you can see from my picture to the left, I like to stay warm and cozy. My dad bought me this fuzzy blanket to help me stay that way. If you have a pet that lives outside, one way to keep them warm is to put extra blankets where they sleep. 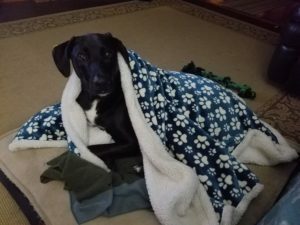 Ask your parents if there are any old blankets that you can use to make your pets bed warmer. Dogs that live in dog houses can be kept warmer too by hanging blankets inside their house on the walls. It will help keep warmth inside their house when they sleep. Jackets are also a good way to keep your pets warm. I have a warm blue winter jacket that I wear when it is really cold outside. If you have a jacket for your pets, always make sure that they are wearing it when they go outside, even if it is for a short time. Boots are another way that you can keep your dog warm. Boots are a funny thing for dogs. I have a pair, but I really don’t like to wear them. It is difficult for dogs to get used to wearing boots, but once we do, they are a good way for keeping our feet warm. When it is really cold out, I will lift my feet up because snow will actually start to stick to them. On days that are really cold like this, I am glad to have my boots on. If your pets spend a lot of time outside, always make sure that they have water to drink. Water freezes when the temperature gets to 32 degrees or below. If the temperature gets this low, it is very important that your family gives your pets water multiple times each day to make sure that they have enough to drink. One last thing I would like to talk about is meals. If your pets live outside, it is important to make sure they get enough food when it is cold. Sometimes pets need a little more food to eat in the winter. During cold weather, it takes more energy for pets to keep their body warm. Giving your pets a little bit of extra food in the cold weather will give them the energy they need to help them stay warmer and healthier in the cold. I hope you will find my tips helpful to keep your pets happy and healthy in the cold winter weather. Do you have any tips you would like to share? You can send them to magicsandboxwebazine@gmail.com and they will make sure I get your messages! It’s time for me to go have some fun and play in the snow now. Thanks for visiting friends!